Experience Universal Orlando Resort™ in Florida, featuring The Wizarding World of Harry Potter™! Admission to all of the Disney and Universal theme parks including Universal's NEW Volcano Bay Water Theme Park! 6 of Florida’s most popular theme parks for one exclusive price! Why get a 2-Park ticket when the 3-Park ticket is the same price? 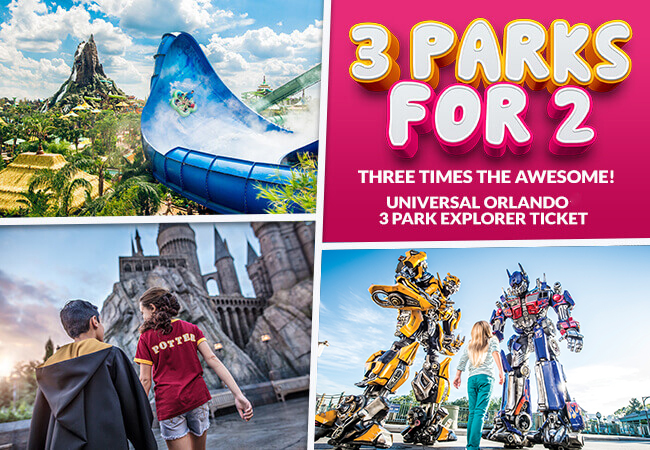 The 3-Park Explorer includes 14 days' unlimited admissions to Universal Studios Florida™, Universal’s Islands of Adventure™ AND Universal's Volcano Bay™ water theme park! *Only applies to 2019 and 2020 tickets only. Universal Orlando Resort: WELCOME TO THE NEXT LEVEL. There’s a new adventure around every corner at Universal Orlando Resort™ in Florida! Jump right into the action of your favourite films and TV shows at Universal Studios Florida™, discover the world's most cutting-edge rides, shows and interactive attractions at Universal's Islands of Adventure™, and live the carefree island life at Universal's Volcano Bay™ water theme park. In the evenings, head to Universal CityWalk™, Orlando’s hottest spot for entertainment with nightclubs, restaurants, concert venues, shops, cinemas and more. And of course, Universal Orlando Resort™ is home to the world-famous The Wizarding World of Harry Potter™ at both Universal Studios Florida™ and Universal’s Islands of Adventure™ which you definitely won’t want to miss whether you’re a Harry Potter™ fan or not! Universal Studios Florida™ takes you beyond the screen, behind the scenes, and right into the action of your favourite films and TV shows! Ever wondered what it’s like to party with the Minions from Despicable Me? Or to fight on the front lines of an intergalactic war between the Autobots and Decepticons on TRANSFORMERS: THE RIDE-3D? And you can’t miss a visit to Springfield to meet everyone’s favourite family – The Simpsons™. Snap a picture with Homer, Marge, Bart, and Lisa at Springfield, U.S.A.™! Get ready to have fun with your favourite childhood heroes, comic book stars and cartoon characters at Universal’s Islands of Adventure®, one of the awesome theme parks at Universal Orlando Resort. Universal’s Islands of Adventure® is also home to The Wizarding World of Harry Potter™ - Hogsmeade™, where you can explore the mysterious corridors and passageways of Hogwarts School of Witchcraft and Wizardry! For the first time ever, join Hagrid™ as you fly deep into the Forbidden Forest, beyond the grounds of Hogwarts™ castle, on a thrilling roller coaster ride to discover the rarest magical creatures. Plus, with an Explorer Ticket you can travel between both lands of The Wizarding World of Harry Potter™ by riding the Hogwarts™ Express# between Hogsmeade™ Station at Universal's Islands of Adventure® and London at Universal Studios Florida®! Located at Universal Studios Florida®, this is just about as close to actually living in the enchanting world of wizards and witches as you can get! Universal's Volcano Bay™ is a water park for the 21st Century, where there's no waiting in long lines, no carrying rafts around the park… nothing between you and a full day of fun! Using state-of-the-art new technology called TapuTapu™ wearables, you can hold your place in the ride lines with just a wave of your wrist. So there’s less time waiting in line and more time to careen down slides, brave whitewater torrents, drift down a winding river, or relax in your own waterside cabana. This is where your evenings really come together. Celebrity DJs at a high-energy club. Mysterious Blue Men. Live music over dinner and drinks. Grab a seat. It's all about to begin…. There are specific boarding requirements, and accommodations for those using wheelchairs, listed at each attraction. The Universal Orlando 2 Park Explorer Ticket entitles one (1) guest admission to Universal Studios Florida, Universal’s Islands of Adventure and select live entertainment venues of Universal CityWalk, on all days during a fourteen (14) consecutive calendar day period which includes the first day any portion of the ticket is used. Unused days shall be forfeited. The Universal Orlando 3 Park Explorer Ticket entitles one (1) guest admission to Universal Studios Florida, Universal’s Islands of Adventure, Universal’s Volcano Bay water theme park, and select live entertainment venues of Universal CityWalk on all days during a fourteen (14) consecutive calendar day period which includes the first day any portion of the ticket is used. Unused days shall be forfeited. THE SIMPSONS RIDE TM Twentieth Century Fox Film Corporation. The Simpsons TM & © 2018 Twentieth Century Fox Film Corporation. All rights reserved. © 2018 MARVEL. Jurassic Park TM Universal Studios/Amblin. TRANSFORMERS and its logo and all related characters are trademarks of Hasbro and are used with permission. © 2018 Hasbro. All rights reserved. Universal elements and all related indicia TM & © 2018 Universal Studios. All rights reserved.